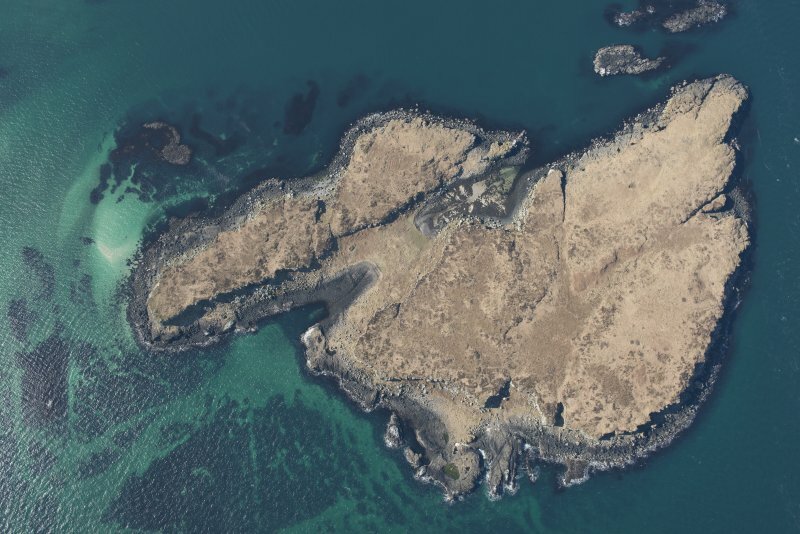 Oblique aerial view of Fladda, Treshnish Isles, looking NE. 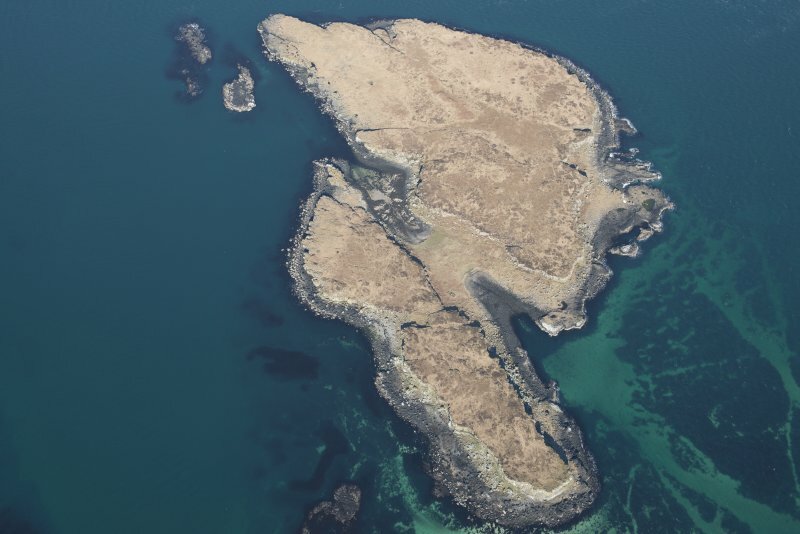 Oblique aerial view of Fladda, Treshnish Isles, looking NW. Fladda is a heather-covered island nearly a mile long, and towards its S end is a low-lying grassy isthmus, with a natural harbour on each side. In the centre of this level part are the foundations of a wide circular wall, which seems the more significant from the fact that quite near it are six small mounds of turf and stones. If there was any dun on Fladda, this seems to be the site. NM 2970 4380: Situated in a sheltered and formerly cultivated ground, with run rig and clearance cairns nearby, is an oval stone-walled enclosure associated with a rectangular foundation orientated E-W. The rectangular building measures about 8.0m E-W by 4.0m over a rubble wall 1.0m wide with a few outer facing stones visible. No entrance can be seen. The faced rubble wall encloses an area measuring 16.0m N-S by 12.0m, to the W of the building, and measures up to 1.0m wide and 0.4m high. No entrance is visible although two breaks occur where it springs from the N and S sides of the building. Within the interior of the enclosure and 3.0m due W of the building is a pile of stones measuring 2.0m in diameter and up to 0.3m high. Although it is possible that this is no more than an old shieling and enclosure, the oriented building and the cairn within the enclosure, being similar to the Early Christian burial cairns on Colonsay, possibly indicate the remains of a chapel and burial ground. Visited by OS (D W R) 6 May 1974.